Can you grow cauliflower in a container? Cauliflower is a large vegetable, but the roots are surprising shallow. If you have a container wide enough to accommodate the plant, you can definitely grow this tasty, nutritious, cool-season veggie. Read on to learn about container gardening with cauliflower. When it comes to growing cauliflower in containers, the first consideration, obviously, is the container. A large pot with a width of 12 to 18 inches and minimum depth of 8 to 12 inches is adequate for one plant. If you have a larger pot, such as a half-whiskey barrel, you can grow up to three plants. Any type of container will work, but be sure it has at least one good drainage hole in the bottom, as your cauliflower plants will rot quickly in soggy soil. For growing cauliflower in containers, the plants need a loose, lightweight potting mix that holds moisture and nutrients but drains well. Any quality commercial potting soil consisting of ingredients such as peat, compost, fine bark and either vermiculite or perlite works well. Never use garden soil, which quickly becomes compacted and prevents air from reaching the roots. 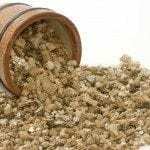 You can start cauliflower seeds indoors about a month before the average frost in your climate, or you can plant seeds directly outdoors in the container when temperatures are about 50 F. (10 C.). However, the easiest way to begin container gardening with cauliflower is to purchase seedlings at a garden center or nursery. Plant seedlings about a month before the last average frost date if you want to harvest cauliflower in spring. For a fall crop, plant seedlings about six weeks before the last average frost in your area. Place the container where the cauliflower receives at least six hours of sunlight per day. Water the plant until water runs through the drainage hole whenever the soil feels dry to the touch. Don’t water if the potting mix is still damp because plants can rot quickly in soggy soil. However, never allow the mix to become bone dry. Check the container every day, as soil in container dries quickly, especially during hot, dry weather. 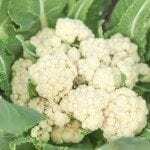 Feed the cauliflower monthly, using a balanced, water-soluble fertilizer. Alternatively, mix a dry, time-release fertilizer into the potting mix at planting time. Your plants may need a little help to ensure the vegetables are tender and white when you’re ready to harvest. This process, known as “blanching,” simply involves protecting the heads from direct sunlight. Some varieties of cauliflower are “self-blanching,” which means the leaves curl naturally over the developing head. Watch the plants carefully when the heads are about 2 inches across. If the leaves aren’t doing a good job at protecting the heads, help them along by pulling the large, outside leaves up around the head, then secure them with a piece of string or a clothespin.